Mummy says…. It’s true what they say about teenagers hardly leaving the house these days. With iPhones, Xboxes, PS4s and all the other technological stuff they basically live in their bedrooms. 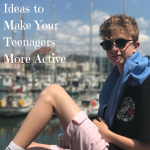 I get a little fed up of seeing them snapchatting each other instead of being outside actually hanging out with their real friends so I have thought of some ways I can encourage my teenagers to get out this summer which might help to make your teenagers more active too. One place that certainly looks like the place to be whenever I drive past is our local skate park. Packed with young people skate boarding, roller blading and on micro scooters, these hobbies definitely look like a good way to get your teens out of the house and with so many other people there, they’re bound to make new friends. At Proline Skates, you’ll find an awesome selection of roller blades and Heelys which could be just the present they need to hit the skate park, instead of the Xbox on a Saturday afternoon. There are so many different hobbies out there that there’s sure to be one your teens like. Encourage them to take up something new, be it tennis, squash, football or netball. Take a look at what’s on offer at your local sports centre or do some research online and see if you can get them to show some interest in anything at all. Who knows? They might end up loving a brand-new sport they’d never even considered trying out before and it could be the start of a whole new healthier and fitter lifestyle for them. Luke is interested in the brand new gym at our leisure centre too, they have many different membership options for young people. Whilst playing an instrument doesn’t necessarily make a teenager more active, it could lead to them joining a band or even starting up their own band which is a great way to get them out of the house and more active in general. From guitars to the drums or even the bass, this hobby could lead to something more that encourages them to get out and about and spend less time staring at a screen. We have a couple of guitars in our house and Lea (teen sister) has several keyboards so they do jam together sometimes already. Or free running as it is also known – regular readers will know that Luke has loved doing this is the past, it is a great physical activity and one which demands great concentration, focus and agility – perfect for tiring a teen out! There are lots of ideas to make your teenager more active – do you have any to add? Totally agree with this. Even if everything they do isn’t active as such, It’s still better for them than sitting in the house. Mine all went to sports clubs and all had an instrument. Two of the three continued with music and all three have been very active in sports. I truly believe this kept them healthy, kept them out of trouble and stopped them being in gangs. Teenagers and adults alike need something positive to focus on. Think these are great ideas. Healthy for them! I can’t imagine a day when my kids will be teens as they are so blooming active right now! Great ideas here, my daughter is desperate to start piano lessons again, so definitely a mission for our summer. My daughter recently finished her G.C.S.E.’s, and the run up to them was much time spent inside, studying. Now she has finished, she has hibernated in her room and I barely see her. Which I hate. I get that she wants her time, and her time is spent, as you say, communicating on devices. What annoyed me was offering to take her to the coast the other evening, just to get some air (I needed it, as did the 5 year old), and she didn’t want to go. I would love to see her out and about more, free running would be fabulous. I just can’t see it happening, ever. But, what I will do is get her out on days out, regardless. She may have more of a choice now with having her own opinions, but she is still my daughter and for her own well being, I feel she really does need to get out a lot more! My teenage daughter is a nightmare. Not only does she not like going outside, she won’t even open her curtains and let any light into her bedroom! She should have been born a vampire lol.